Brand Warranty: 1-Year For Parts & Services. Only Supply of the unit installation. Siemens iQ500 Dishwasher is a must-have appliance in your kitchen arsenals. This Siemens dishwasher flaunts a beautiful silver shade.Do you find dishwashing a herculean task? Worry no more! With the Siemens SN26L880GC 60cm iQ500 Dishwasher, dishwashing will become a child’s play. Siemens iQ500 Dishwasher is a must-have appliance in your kitchen arsenals. This Siemens dishwasher flaunts a beautiful silver shade.Do you find dishwashing a herculean task? Worry no more! With the Siemens SN26L880GC 60cm iQ500 Dishwasher, dishwashing will become a child’s play. This appliance cleans your dishes three times faster, which means you can give more time to your family members now. The Siemens iQ500 Dishwasher has four cleaning temperatures that let you choose different temperature for different utensils. This Dishwasher incorporates a self-cleaning filter system with a 3-fold corrugated filter that keeps your appliance spick and span. Whether it’s a hosepipe or leak in the machine, the aquaStop safety system prevents all kinds of water damages. You can adjust the height of the top basket in three stages that allow you to fit more dishes in this appliance. Thanks to patented Zeolite drying, this Siemens dishwasher ensures faster and energy-efficient drying of your utensils. 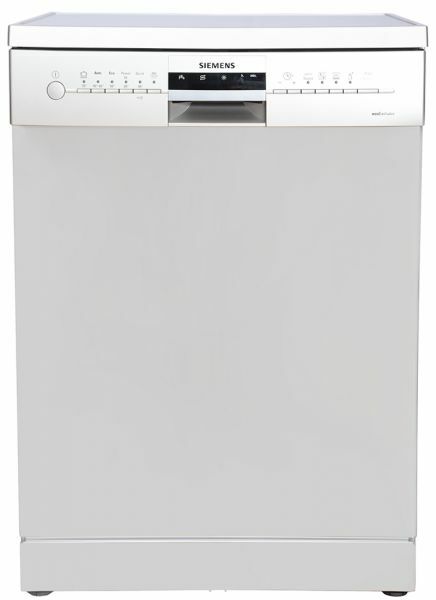 This Siemens dishwasher has a high-resolution TFT display that makes your washing job easy. It displays all activated program information in a well divided and organized manner thus offering a quick view. It also lets you chose individual program settings, quickly and conveniently. The Siemens iQ500 Dishwasher features varioFlex rack and varioDrawer that offer more flexibility for more convenient loading. You can also load larger bowls and bulky items in this appliance, thanks to the varioFlex Plus basket with foldable racks that conveniently accommodates many dishes at a time. The intesiveZone function increases the water spraying pressure to clean dirty dishes in the lower rack. The iQdrive motor consumes less energy and offers an efficient performance. The engine is sturdy enough to withstand the rigors of wear and tear. All the more, the varioSpeed Plus button reduces the washing time by up to 66 percent. The mechanical door lock prevents accidental opening during dishwashing. Wash your glassware with the greatest of care, thanks to the glassCare System that includes a glass protection technology, a unique gentle program, and a heat exchanger. Very quite machine, almost noiseless.